I am currently working on finding my perfect blog-life balance, and life is coming out ahead at the moment. I'm hoping to find a happy medium that doesn't completely exclude either (and a more regular posting schedule would still be swell), but for now I need a little break. Back soon, I hope! 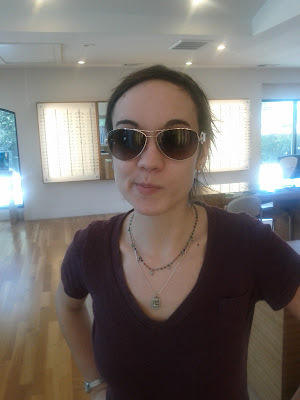 I will leave you with: my new prescription sunglasses. They are not actually mine yet - I had them order the same pair in silver so I can pick one and then order for real. Poll! Can I wear these ("almond" color, not to be confused with gold.. but close) with all of my silver jewelry? I'm normally not a fan of gold-colored things, but man I love these. Mixed metals are totally allowed!! They look cute! Thanks! I definitely trust your fashion sense, so I will keep that in mind when I do my final silver vs "almond" comparison and buy one. I'm leaning towards these!